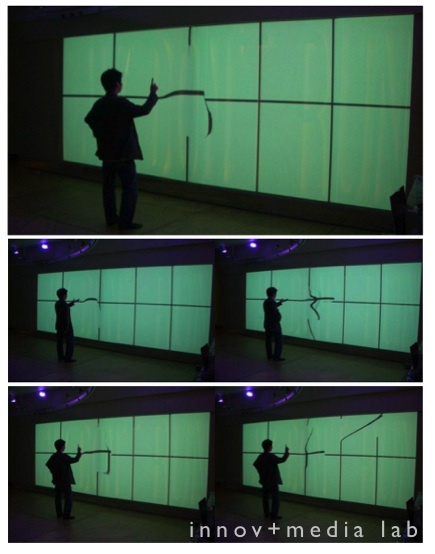 Space Liquid ( Magic Curtain Version ), is based on HUNG Keung’s research project Space Liquid in 2005, in which try to create a digital interface as a platform to represent captured real-time moving images, is designed like the shape of a curtain. This project mimics a visual effect of something behind a curtain that is touching the curtain and creating a bumping effect on the curtain. This effect is similar to that in horror films showing the face of a ghost on a curtain. The program uses a video input device, such as a web cam and digital camera, to capture a real- time image sequence, calculating the contour of the moving objects in the image and displaying the bumping effect on a virtual curtain in the 3D environment. The 3D space/environment can be positioned by panning, zooming, and rotating. In addition to the interactive playing ability. HUNG Keung always been fascinated with the interaction between the human body (shape, movement, physical volume) and virtual space/cyberspace. According to Michael Heim, “cyberspace [is] …a computerized dimension where we move information about and where we find our way around data. Cyberspace renders a represented or artificial world, a world made up of the information that our systems produce and that we feed back into the system…. We inhabit cyberspace when we feel ourselves moving through the interface into a relatively independent world with its own dimensions and rules” (Michael Heim, The Metaphysics of Virtual Reality, New York, Oxford University Press, 1993, pp. 78-79). “Cyberspace suggests both a physical universe and an imaginary world. It implies a journey without end” (Jun-Jieh WANG, Reception, Communication and Navigation: Artistic Trends in the Digital Age. 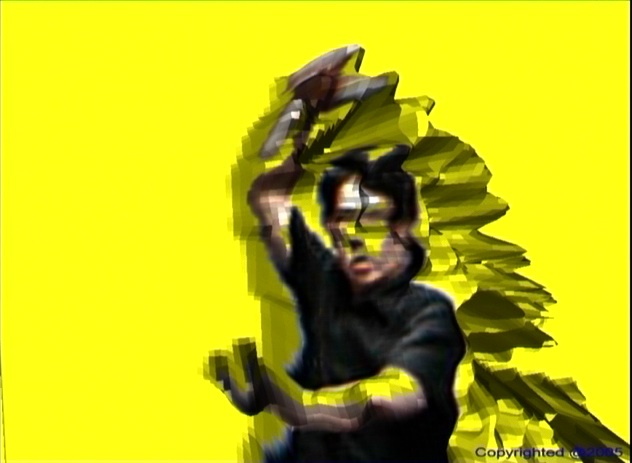 Navigator, Digital Art in the Making, National Taiwan Museum of Fine Arts, 2004,pp.97). How to study the word “journey” between our body (existing) and the body (virtual) is also my interest and a direction in my research. Here, the journey is from a human being (existing human body) to virtual and cyber space. Having clear definitions of Virtual, Cyber, and Journey is very important in the first stage of these research activities. As Heim stated, “The first step in virtual realism is to become clear about the meaning of virtual reality in the strong sense of the term, We need to be clear about using virtual reality as a model because the loose or real sense of virtual reality grows increasingly fuzzy….” (Michael Heim, Virtual Realism, Oxford University Press, 1998, p. 3). Here are some definitions of virtual reality that I believe are fundamental for my research. 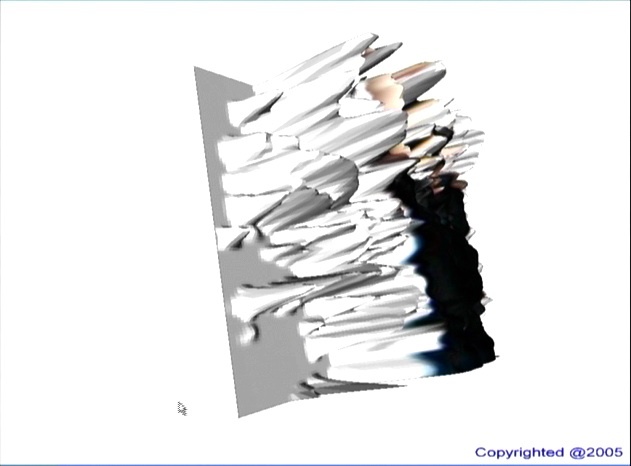 Space Liquid is a 3D software system equipped with the latest Microsoft DirectX technology. 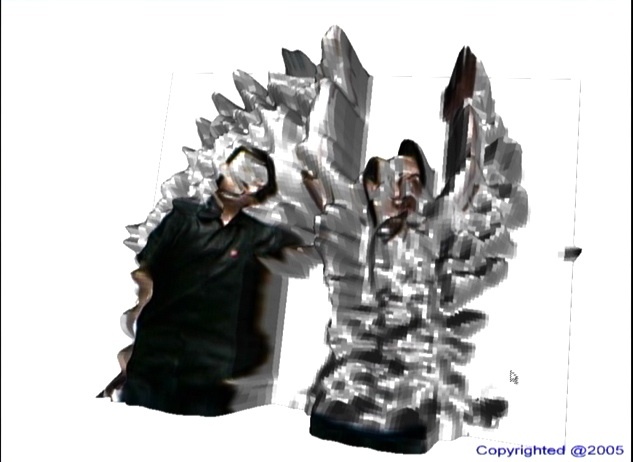 The system mimics a special effect of “ghosts behind a curtain” using a virtual 3D environment. The system includes a camera that records the real-time actions/movements of the player. The recorded action is then used to displace a virtual “curtain” that is displayed in the 3D environment at the same time without any delay in terms of speed and timing. The curtain is displayed either as a grid lattice or a textured towel. When the player moves in front of the camera, the system updates the curtain according to the movement of the player, and the curtain corresponds to the movement with continuous bumping. 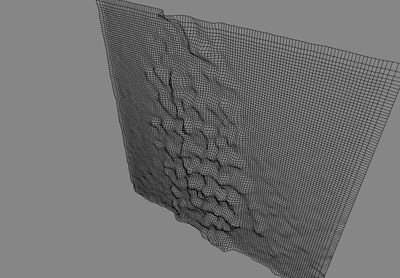 Space liquid, is my recent research project, which try to create a digital interface as platform to represent a captured real time moving images, is designed like the shape of curtain. This project mimics a visual effect which is something behind a curtain touching the curtain and creating a bumping effect on the curtain. This effect is similar to that in horror films showing a ghost face on a curtain. 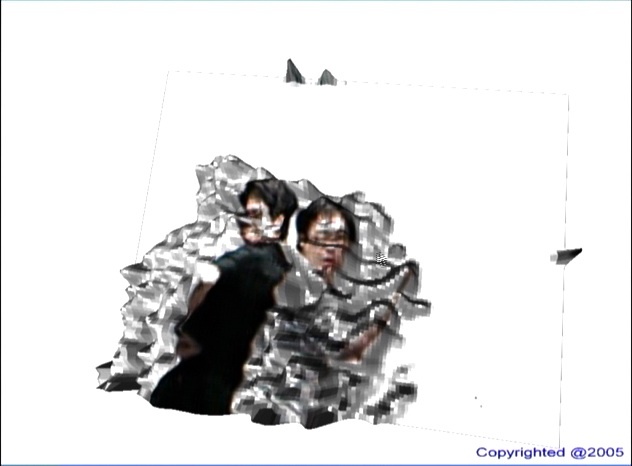 The program uses a video input device, such as web cam and digital camera, to capture a real-time image sequence, calculating the contour of the moving objects in the image and displaying the bumping effect on a virtual curtain in the 3D environment. The 3D environment can be positioned by panning, zooming and rotating. In addition to the interactive playing ability, the program can store the screen content into a movie file for later investigation. I always feel fascinating about the interaction between our human body (shape, movement, physical volume) and the virtual space/cyberspace. According to the essay of Michael Heim, “cyberspace….a computerized dimension where we move information about and where we find our way around data. Cyberspace renders a represented or artificial world, a world made up of the information that our systems produce and that we feed back into the system……We inhabit cyberspace when we feel ourselves moving through the interface into a relatively independent world with its own dimensions and rules”. (Michael Heim, The Metaphysics of Virtual Reality, New York, Oxford University Press, 1993, pp. 78-79). “Cyberspace suggests both a physical universe and an imaginary world. It implies a journey without end” (Jun-Jieh WANG, Reception, Communication and Navigation: Artistic Trends in the Digital Age. 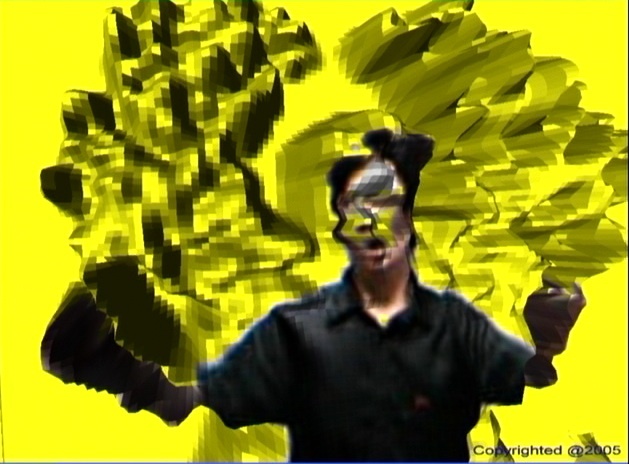 Navigator, Digital Art in the Making, National Taiwan Museum of Fine Arts, 2004, pp.97). How to study the word “ Journey” between our body( existing) and the body( virtually) is also my interests and direction in my reseach. A journey is from a human being (existing human body) to the virtual and cyber space. Before that, the clear definition on Virtual, Cyber and Journey is very important in the first stage of these research activities. As what Heim mentioned “The first step in virtual realism is to become clear about the meaning of virtual reality in the strong sense of the term, We need to be clear about using virtual reality as a model because the loose or weal sense of virtual reality grows increasingly fuzzy….” ( Michael Heim, Virtual Realism, Oxford University Press, 1998, pp. 3). Here is some definition of virtual reality which I believe it will be a fundamental for my research. “Virtual reality is an immersive, interactive system based on computable information. These defining characteristics boil down to the “ three I’s” of VR: immersion, interactivity, and information intensity. Immersion comes from devices that isolate the senses sufficiently to make a person feel transported to another place. Interaction comes from the computer’s lighting ability to change the scene’s point-of-view as fast as the human organism can alter its physical position and perspective.